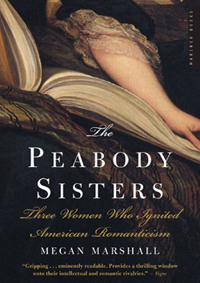 Megan Marshall, author of The Peabody Sisters: Three Women Who Ignited American Romanticism (a finalist for the Pulitzer Prize) gave a presentation about Elizabeth, Mary, and Sophia Peabody who played central roles in the Age of American Romanticism. Elizabeth was a powerful influence on Emerson, Hawthorne, and Thoreau. The determined and passionate reformer Mary found her soulmate in Horace Mann. And Sophia, though overshadowed by husband Nathaniel Hawthorne, was an admired painter, writer, and thinker in her own right. As young women, Elizabeth and Mary ran a private school in Brookline, at the corner of Washington and Cypress Streets, from 1825 to 1832.